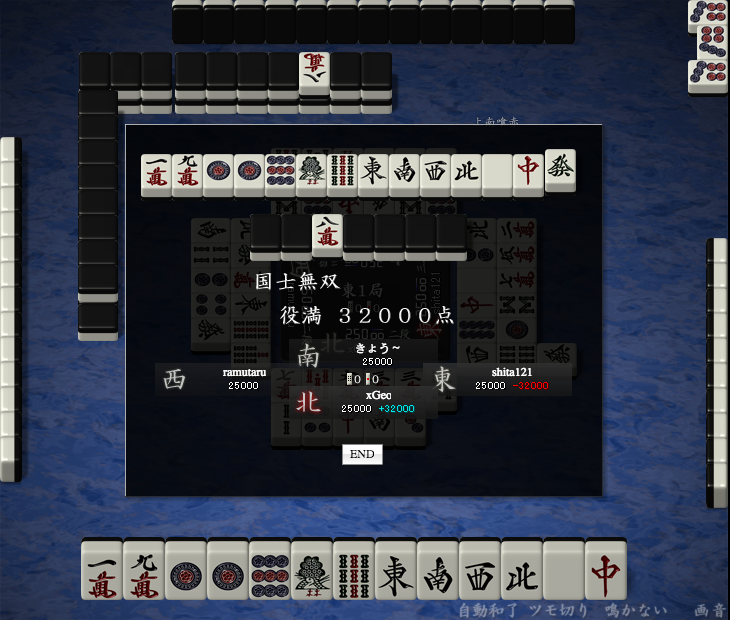 I just got my 2nd yakuman on Tenhou ever! This is also my first Kokushi Musou. I started the hand with 10 terminals and honors (yaochuuhai). I almost considered restarting the game with kyuushukyuuhai which is a condition to redeal if a player has 9 or more different types of yaochuuhai. Since I had 10, I decided to go for it. Luckily I got tenpai waiting on the hatsu just after the 3rd hatsu was played. The dealer was going for tanyao and dealt the 4th hatsu on the turn after. Categories: Tenhou | Tags: Japanese mahjong, Kokushi Musou, mahjong, Reach Mahjong, riichi mahjong, Tenhou, Yakuman | Permalink.